Having a child drastically changed my cooking. Most drastically: the amount of items I make at home. Pre-child, I’d easily spend hours in the kitchen making homemade everything. I don’t have that kind of time anymore and occasionally I miss. And so, I’ve been trying to add some of these items back in. One of my favorite items to hand make: pasta. Pasta is a fairly basic homemade item but it’s beyond worth it. The flavor and texture is unmatched by the dried pasta found in grocery stores. While I like to grind my own flour for the pasta, I wanted to share a recipe that didn’t involve that (and was a bit more friendly to people who might not fully be on the 100% whole wheat flour train). Bob’s Red Mill all-purpose flour is a staple in our home. I use it in my sourdough starter and I use it when I’m making breads (because I’ve yet to nail a 100% whole wheat loaf that I’m in love with). This pasta is 50% all-purpose and 50% white wheat flour. 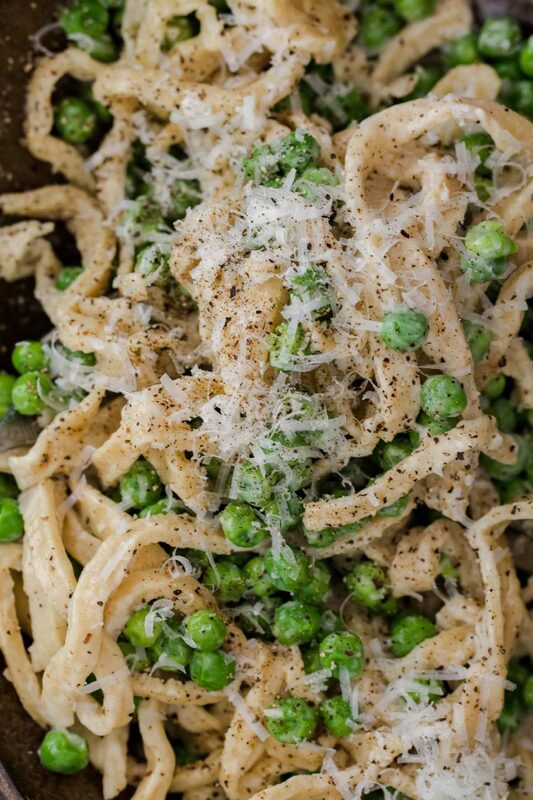 The combination makes the most tender homemade pasta which is perfect in this garlicky pea pasta. Vegetables: Swap the peas for whatever is in season. During the summer, roast zucchini squash or cherry tomatoes. During fall, try roasted sweet potatoes or butternut squash. 100% whole wheat: Drop the all-purpose and use all whole wheat flour. You could also add spelt or rye flour to the mix. Vegan: I realize this recipe is about as far from a vegan meal as you could get BUT it’s possible. I’d recommend make a water-based pasta (like this) and replace the sauce with this almond-based sauce. Combine the flours and salt on a clean, flat surface. Make a well in the middle, crack the eggs into the well. Using a fork, whisk eggs and slowly begin to incorporate the flour. Keep mixing and once the dough starts to form, switch to your hands and knead the dough until the dough is smooth, adding a few splashes of water as needed to bring the dough together. The dough should feel barely sticky but feel firm. The dough should also spring back when pressed. Form into a disk , cover with a damp towel, and let rest for 30 minutes. Bring a large pot of salted water to a boil and add noodles. Cook until the noodles float to the top and are tender, 4 to 5 minutes. Drain the pasta, reserving a cup or so of pasta water, and set aside while cooking the sauce. Once the pasta is done, heat a pan over medium heat. Add the butter, melt, and add the garlic. Cook the garlic for a minute then measure in the peas. Cook until the peas are tender, 3 to 4 minutes. Measure in the cream and reduce the heat to low. Stir in the parmesan followed by the cooked pasta. Toss to coat the noodles, adding a splash or two of pasta water as needed. Taste and add salt per your taste. Serve the pasta with extra parmesan and freshly cracked black pepper. Tips + Tricks: To reheat, add a few splash of milk or water to the pasta and gently reheat in a pan with a lid.